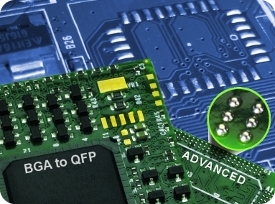 Advanced's patented Solder Sphere Interface streamlines package conversion for use on PC boards with existing QFP pads. Our Adapters and Interposers are custom designed to convert BGA, LGA, or other device packages to an existing QFP footprint or QFP to QFP with the same or different footprint. Transparent interface from a new BGA or LGA device to existing QFP pads. Patented solder sphere connection offers a robust, process compatible, and cost effective replacement for fragile QFP leads. Solutions to obsolescence for most SMT or thru-hole lead styles. Sourcing and device attach for passive and active components. Stand-offs, solder preforms, SMT designs, and more.